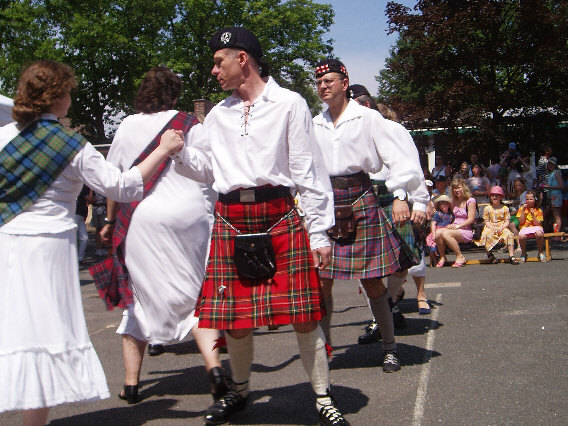 This is a selection from over fourty Scottish dances I have devised so far. Some of the dances have animated graphics to show how the dance is done. But note: Somehow they don't work with Navigator. Try Internet Explorer. Also; keep the mouse over the graphics, otherwise the animation will be interrupted. Should you try out any of these dances, I would be glad to hear from you how it went. A few more dances will be posted here in the future, so do pay a visit again soon. Click here to see me dance at a presentation at the Charles Dickens School in Berlin. I go Scottish dancing with the Scottish Country Dance Society of Berlin, Fridays in the Droste-Hülshoff-Oberschule, in Berlin-Zehlendorf.